This photo was taken in November 2011 at about 6:45 am. The location was at what would become a busy intersection later in the day in Washington DC. The "Take It!" 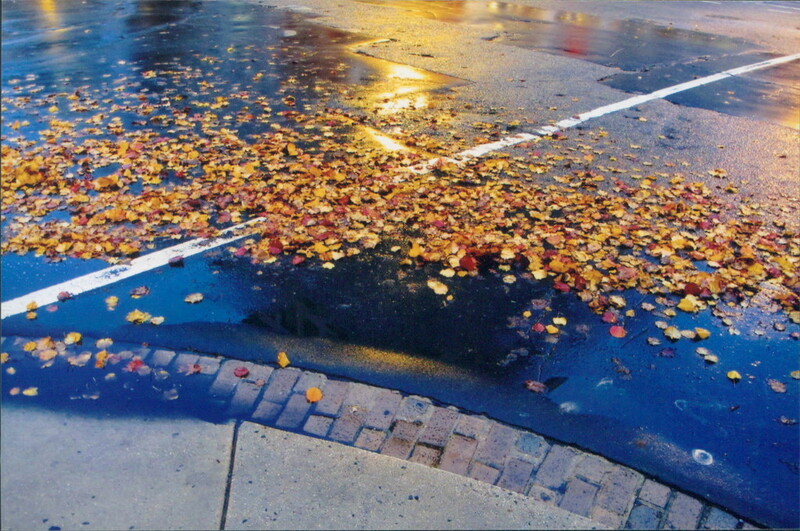 came from looking at the margin of space left between the curb and leaves blown off the sidewalk into the street. Not a perfectly even distance but for a leaf blower, close enough. It was still early enough in the morning that street lights were still on and reflecting of the still wet with rain street. The combination off all these things matched up with the paint for the borders of the cross walks caught my eye. I took these three shots not knowing if I would get anything, but gave it a try. The After Take: I got a feeling that these might be something special when I viewed them at the camera store. I have prints made and sometimes put more light into the shots to bring out what may not be showing up with my constant setting of "Auto" on my trusty camera. I have to admit I am beyond all thumbs when it comes to all the helpful setting in the camera. I just do my best to have my strength in finding the unusual and trying to take photos of it from the best vantage point I can find. Having made the lighting changes to each of these, I placed the order and really did not think too much about it. I can truly say I was pleasantly surprised when I picked up the batch of prints and went through them. These just jumped out and spoke to me with a happy voice. Each photo has its own personality. I do not have a favorite as they are all quite special to me. 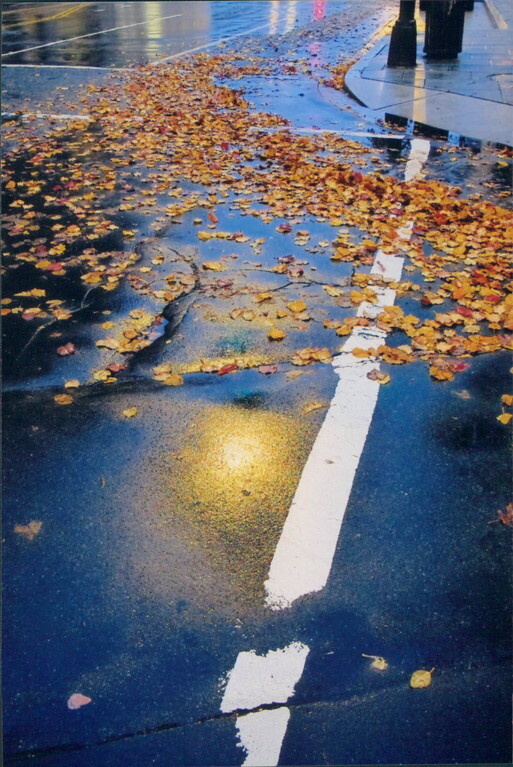 I must say the shot that is verticle has an almost perfect merger/connection with the walk away stripe and a blast of reflective light that is shaped into its own stripe via it passing through a gap between a refuse recepticle and the base of a street light. This was completely by luck, but then the whole set was by luck. 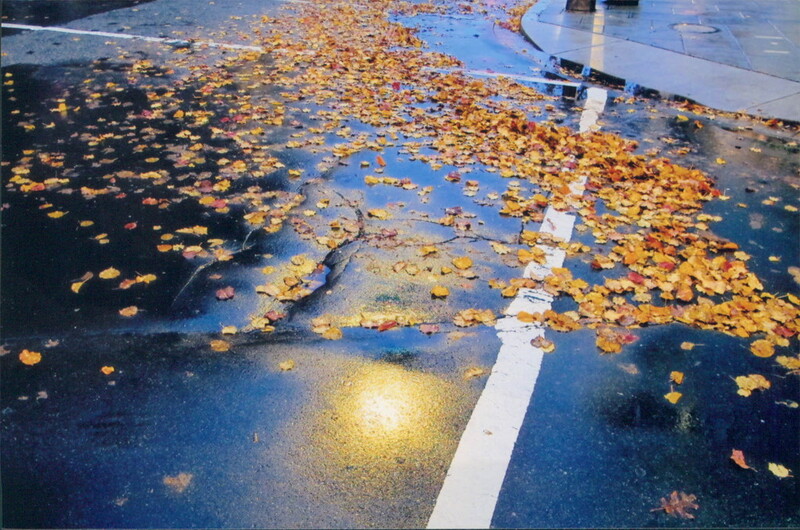 One of the other shots taken with me on the sidewalk shows up with the overhead street light reflecting in some collected water in the asphalt paving that has a sort of zig zag shape to it, sort of giving it a golden river look. The last one which is the least complicated of them seems to almost look like there is a pond with the leaves floating on the surface of it on the right side of the stripe. All who have seen these shots have been quite taken by them. I must say each time I show them I join the viewer in a renewed sense of awe of how this visual gift of this intersection was given to me. To be able to share them, becomes yet another gift. Abundance surrounds us and is sometimes found under foot. Thanks for joining us for the current photo presentation. You are cordially invited to return Tuesday, September 11th for a new picture that we hope you will enjoy. If turned upside down it would appear to be a golden sun shining on bright, braided rivers of leaves. Very lovely. When I walk out in the morning and see this, I shutter.